Last night we went to the beach – it is everything we could have hoped for. Dry sandy dunes, perfect for hide and seek, and a wide sandy expanse, great for dog frisbee at low water. Dawn was shortly followed by a blustery day so the idea of sitting on the beach got blown away. Instead we took the tram to zeebrugge to search for the memorial to those killed in the ferry disaster just over three decades ago. The boys went in the Burley honey bee, which worked well, and seems to be a useful bit of kit. Soon after we disembarked from the tram the heavens opened in a squally shower. We took refuge in the lee of a derelict office doorway and lunched on cheese sandwiches. We failed to find the official memorial, instead had our moment’s reflection by a memorial for Belgium’s naval casualties. After returning to our van, it was still hissing down with rain, so, even though I knew it would upset my Belgium net-friend, we decided to retire for a nap and watch a DVD. Five minutes later, the clouds blew away, so, knowing it would please my Belgium net-friend I took the boys to the playground on their pedaless bikes and here I tap. 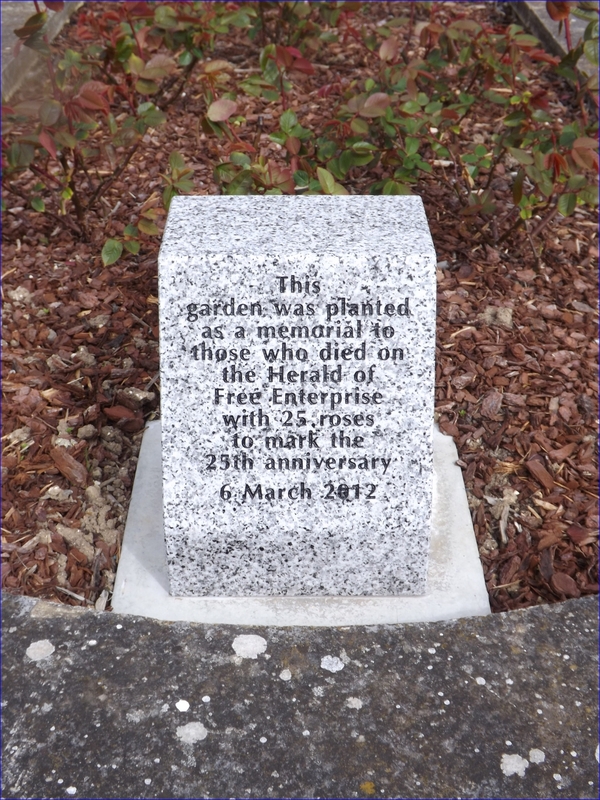 The commemorative stone of the disaster of the Herald of Free Enterprise is in a rosegarten across the Sint-Donaaschurch. I keep on forgetting my password to approve comments – and I’m just learning about blogging. All comments are welcome. No problem; I thought I did something wrong so you couldn’t post it. And of course, a password is something you can forget with all the great impressions you have at your trip!